Hello friends. It's been a time of shell-shock for us here in New Zealand after the horrific terrorist attack just a week ago in our second biggest city of Christchurch, which shattered the calm of a quiet, peaceful country where we always felt 'safe' from such ghastly events that tended to occur in the busier regions of the Northern Hemisphere. As if the people of Christchurch hadn't already suffered enough from a pair of devastating earthquakes just a few years ago! Our hearts go out to those folk. On a lighter note, if that's at all possible, I'm happy to present the third installment in the comprehensive career retrospective on my all time favourite matte and visual effects practitioner, Mr Albert Whitlock. 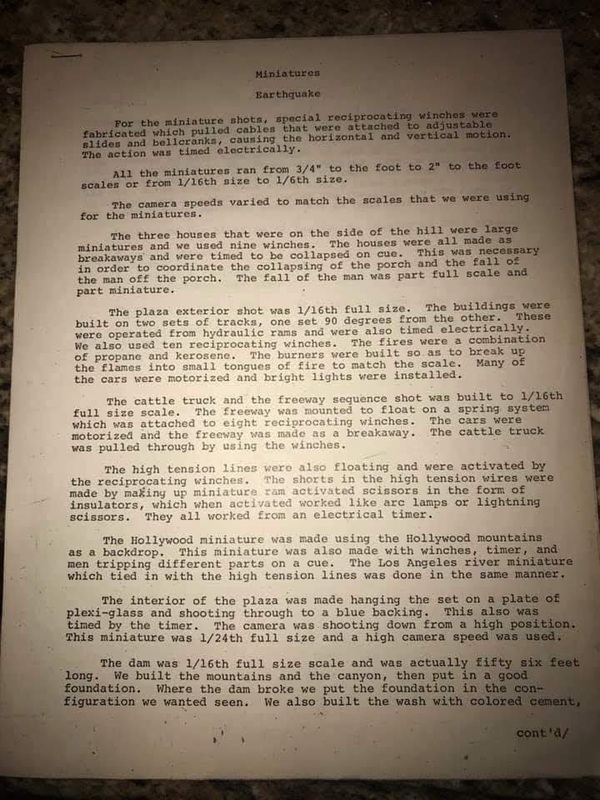 Today's edition is somewhat slimmer than the previous two mammoth entries as it's really more along the lines of an addendum for material just discovered as well as some long overdue identification of some mystery shots that have circulated for years. I have also re-examined a few wonderful mattes, now in the form of high quality BluRay images that had already appeared in the previous blog only as DVD frame grabs as I feel the step up in resolution with these is remarkable and much can be gleaned from some select detailed 'blow-ups' as to Al's technique, which of course is expressly why you (yes... I'm addressing you all!) are reading this blog in the first place. As with the earlier blogs, I've added in some 'possible Whitlock' shots that may, or may not be the work of Albert, mostly from early films that date from around the time Russell Lawson left Universal and Whitlock took over the matte department, circa 1961-62. 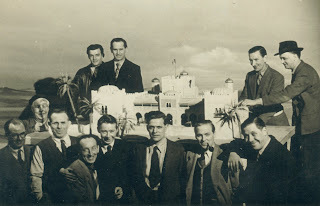 We may never really know for sure, but here they are, many of them courtesy of my matte shot detective friend in Madrid, Spain, Domingo Lizcano, who has studied and scrutinised so many of those images and films and can spot a matte at 500 metres. For those who don't already know, noted Whitlock documentarian and film-maker, Walton Dornisch, has been gradually uploading his special series on Albert to YouTube, (which may be found here) with the installments now at part three, with one of Al's before and after matte shot reels now online, along with the wonderfully candid doco which sets out just how Walton came to be 'hooked on Whitlock' in the first place. 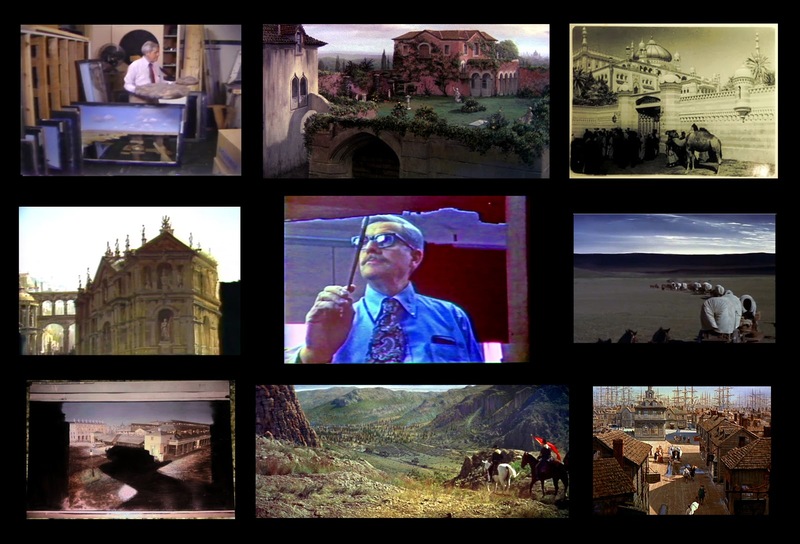 Also available for online viewing is the original Albert Whitlock - Master of Illusion 30 minute doco by Walton and associate Mark Horowitz which initially aired in 1980, and is now looking better than it ever did as a high-def remaster. 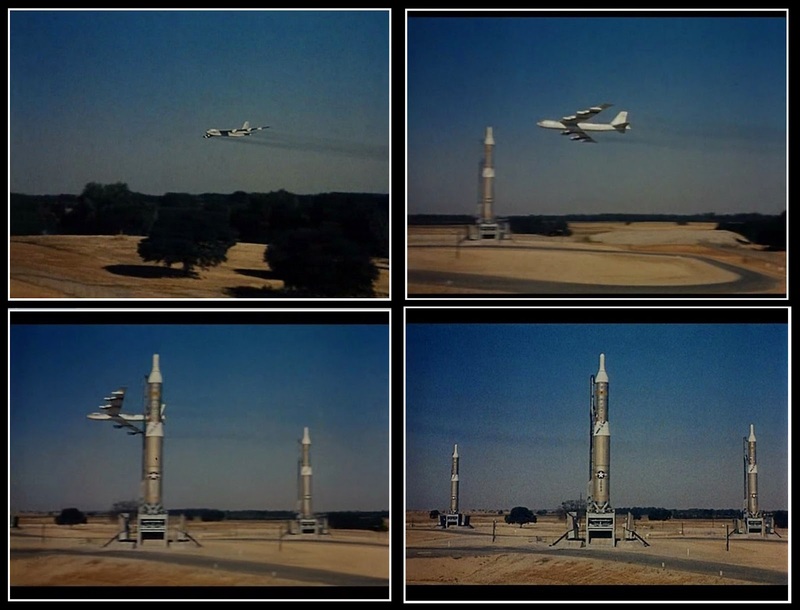 I've included a few shots from it in this blog as the images are quite a step up from the shoddy online pirated versions and my own old VHS version I taped off TV back in 1980, which is still one of my most treasured possessions. 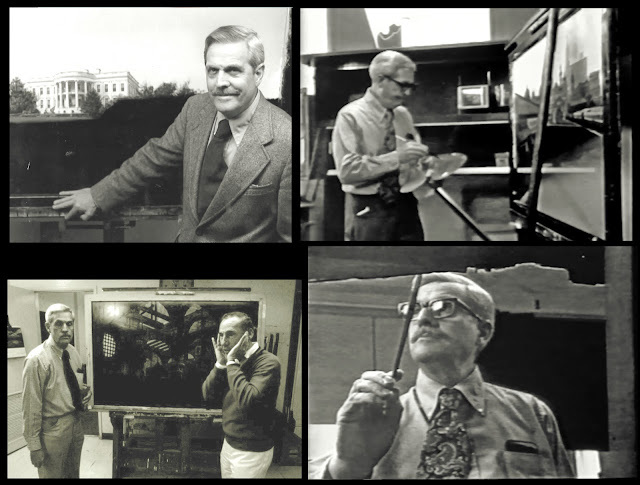 So, in a relatively modest blog post (by NZPete standards at least), please enjoy a selection of mattes and magic, some familiar and many completely fresh, which will further expand one's appreciation of the master and his work. 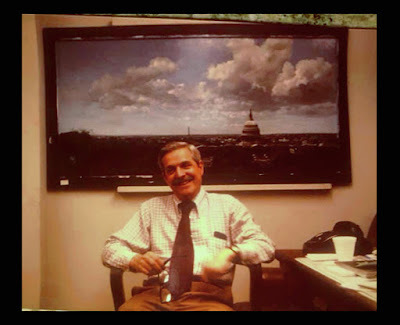 Albert in his office at Universal with the magnificent full matte painting the is the opening shot of AIRPORT 77. I was very much hoping to include close ups of the still privately owned painting but unfortunately didn't hear back from the owners, who had already been most generous with other mattes included in the previous blogs. I don't want to over extend my welcome as any of this material is so gratefully received. 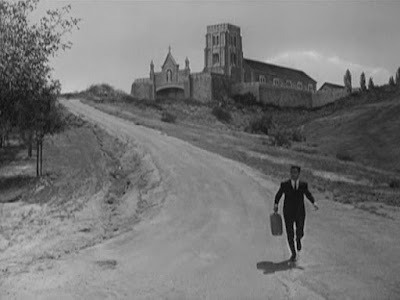 A recently discovered Universal matte shot sent to me by my FX pal in Madrid was this one from FOR LOVE OR MONEY (1963) which is most likely to be Whitlock's work. 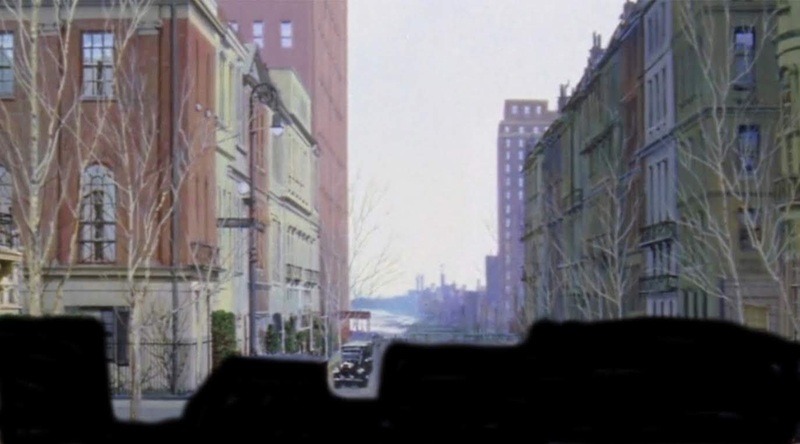 Also from the same film is this curious shot where it appears the facade of the building (and it's shadow) has been painted in for this downview. A recently uncovered studio portrait of Albert at J.Arthur Rank's Pinewood Studios in 1951. 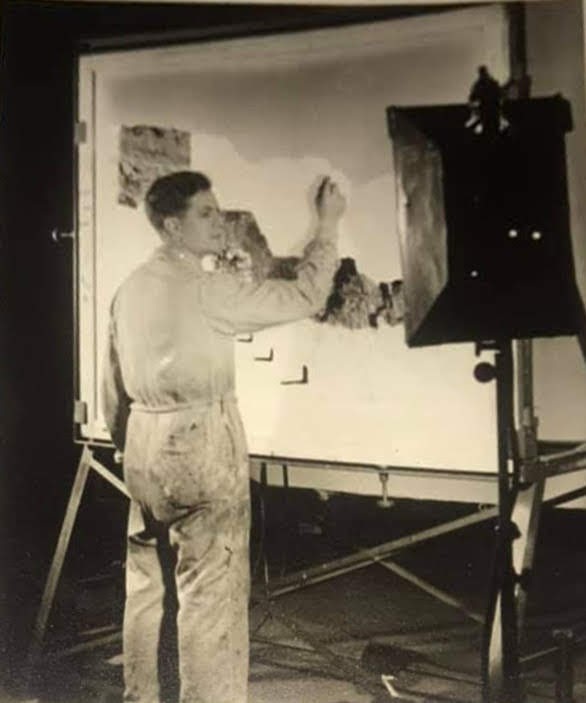 The matte painting he's at work on is for the film A NIGHT WITHOUT STARS. The picture came to light by way of Al's grandson and this along with a dozen others made their way to me and I'm absolutely thrilled to be able to share them here. A NIGHT WITHOUT STARS (1951) which I had included in the last blog purely as an educated guess that Al may have worked on the film, due to the timeframe of his employment at Pinewood. Now I can be absolutely certain about it and the before and after pics confirm this. Note the pencil lay in on Al's as yet unfinished artwork, where much is still to be added. Now, I know I've already shown this shot from ONE MORE TRAIN TO ROB (1971), but it was only when I had the chance to view a BluRay copy that what I had always figured was just a minor 'fix up' job with trees painted around George Peppard - possibly to mask out some unwanted background - is in fact a far more substantial trick shot. Al's matte art not only includes the tree branches but also paints in the entire upper half of the frame, with the hills, sky and all the rest of it being invisibly blended in. 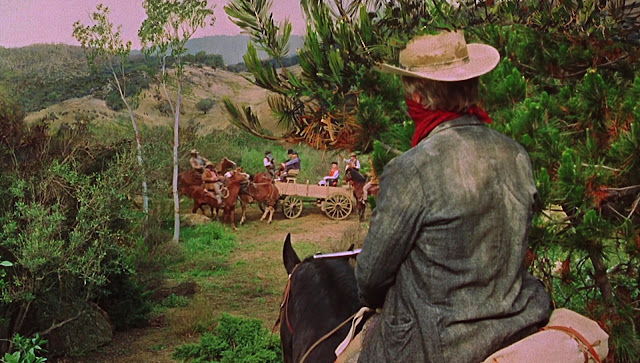 The split runs just above the heads of the guys in the wagon and curls up around Peppard's hat. 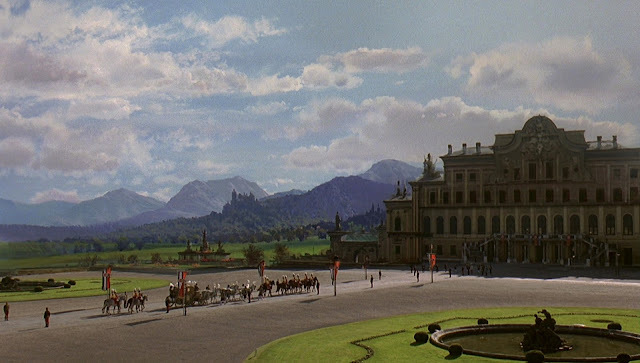 I've included BAD LORD BYRON (1948) again too as I uncovered a wonderfully detailed drawing by the art director Maurice Carter which precisely equates with the matte shot that Whitlock would paint - and receive screen credit for! 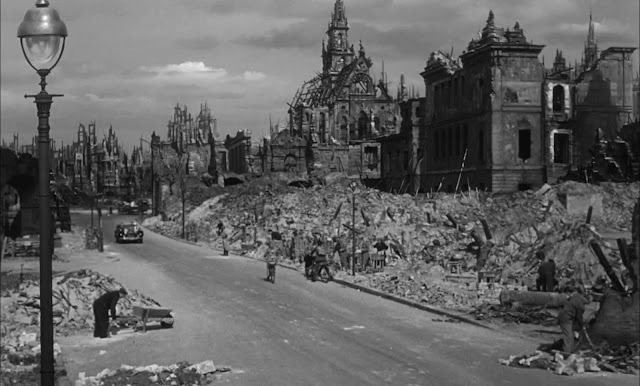 As best Al could remember, this was in fact his first ever matte shot. 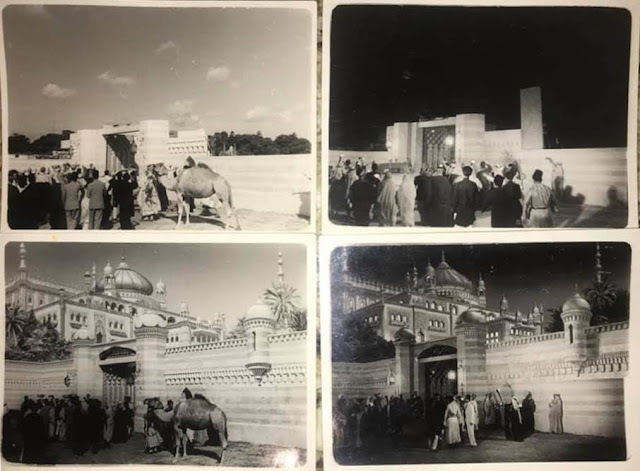 Effects shots from Pinewood's ESTHER WATERS (1947) with matte art top ups of sets as well as what looked like an elaborate miniature (left) augmented by painted cutouts of distant buildings and moving train. Albert was in the department then so might have worked on these shots with Les Bowie. A previously unidentified matte shot from Universal's THE RAIDERS (1963) is certainly the work of Whitlock. 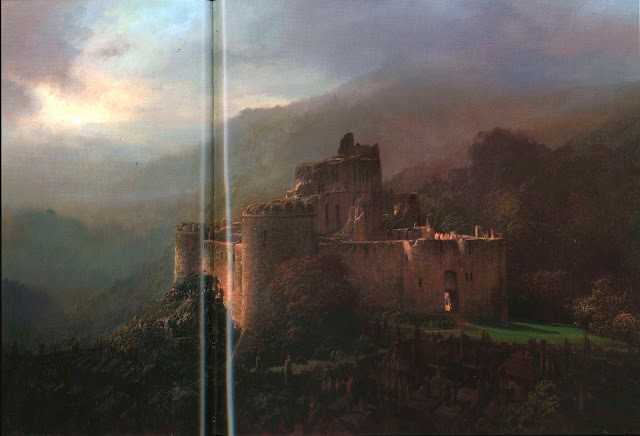 Another of Albert's mattes from THE GLORY GUYS, with this being a full painting of a vast Indian encampment. 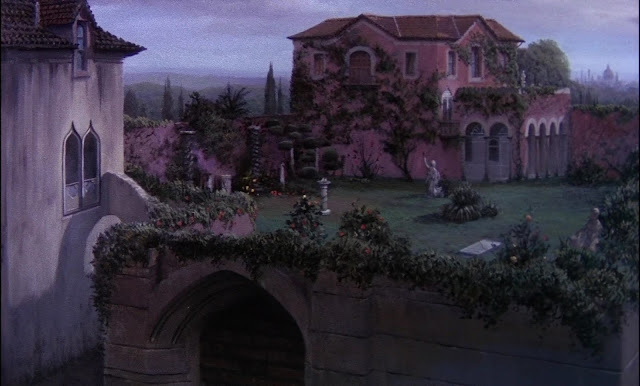 From the Tony Curtis film THE GREAT IMPOSTER (1961), this may not be Al's work as the perspective drawing isn't quite right. 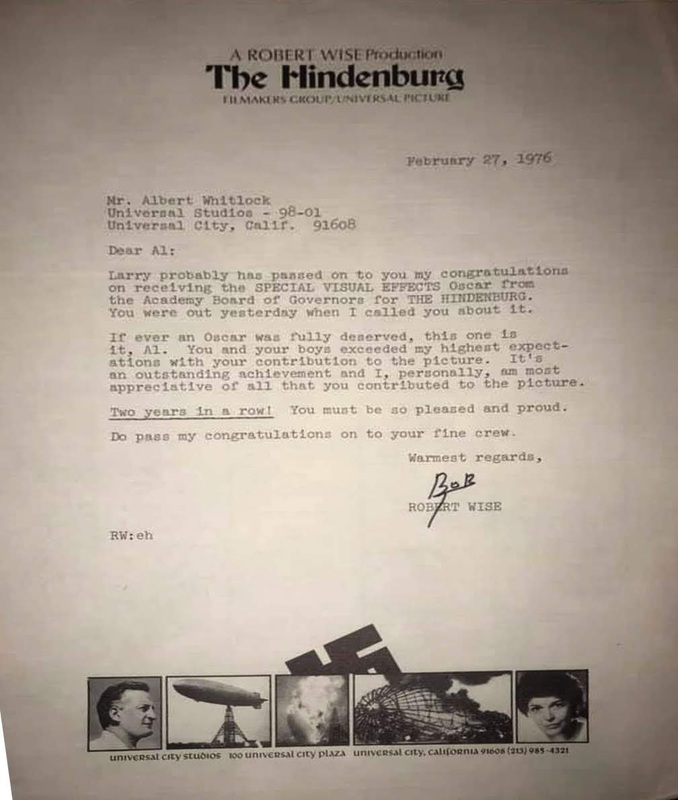 The film was made right around the time Russ Lawson was finishing up at the studio and Albert was coming on board, so it's very uncertain, but here it is anyway. 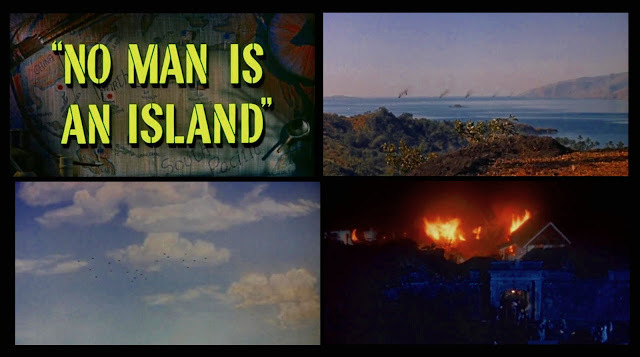 Another Universal-International picture, NO MAN IS AN ISLAND (1962) had a couple of matte effects of ships on a distant horizon and a squadron of fighter planes in a cloud filled sky etc. My friend in Madrid thinks this could be Al's work but I tend to disagree. The cloud work (Al's specialty) is just too 'cotton candy' in texture to my eyes and just not at all how Whitlock would paint a sky. 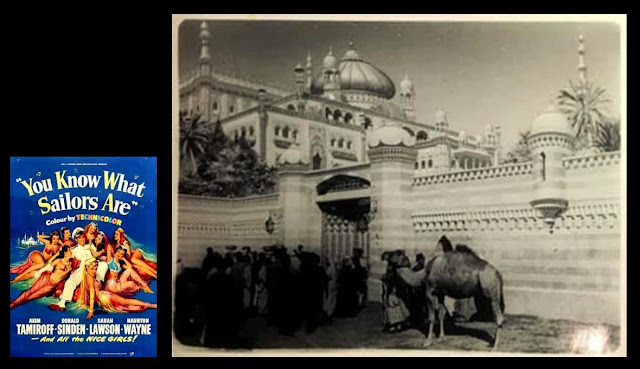 The date matches Albert's tenure but perhaps the effects work and production started somewhat earlier? 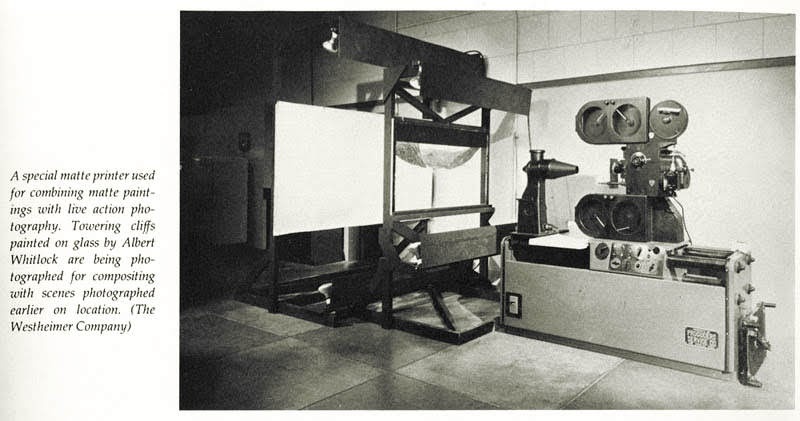 An unidentified before and after by Albert, almost certainly from his English studio days at Pinewood. 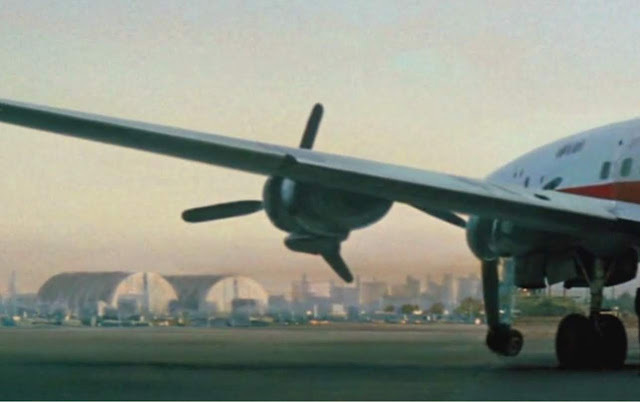 If anyone knows the film, please let me know. 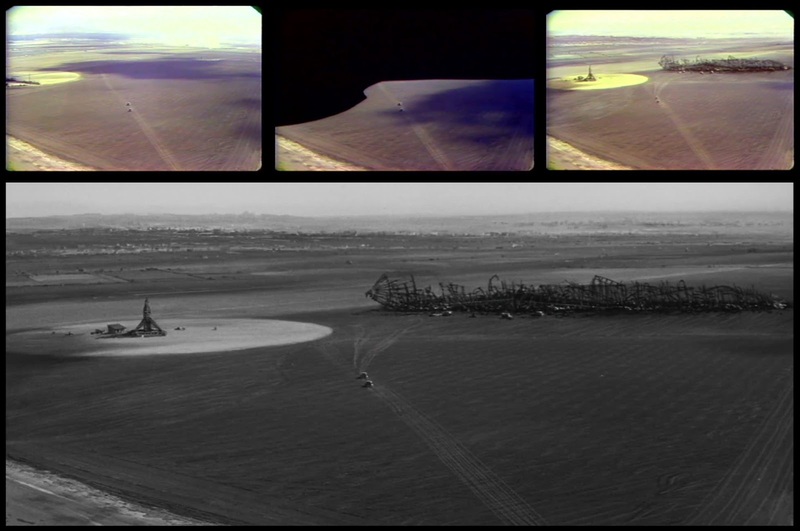 Two frames from a comic sequence in Universal's THE BRASS BOTTLE (1964) with Tony Randall and Burl Ives. 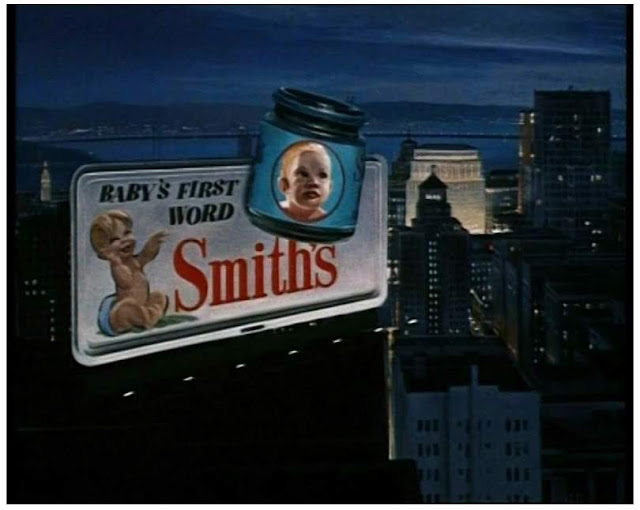 The film had plenty of optical tricks and genie gags, courtesy of screen credited Roswell Hoffman, who was Al's matte cameraman, though Al was not credited at all. 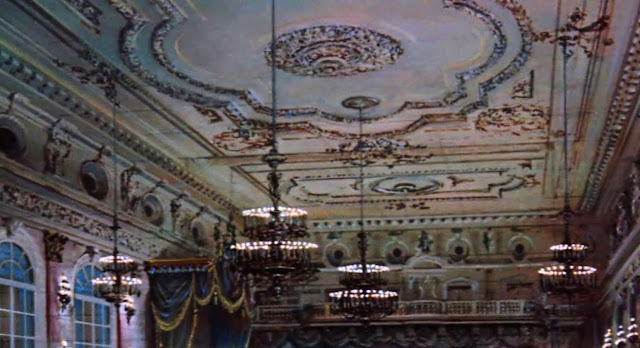 The only shot resembling matte art was this courtroom sequence where it is most probable that the ceiling has been painted in for a sound stage set. Repeat 'toggling' through individual frame grabs shows sleight matte line jitter. 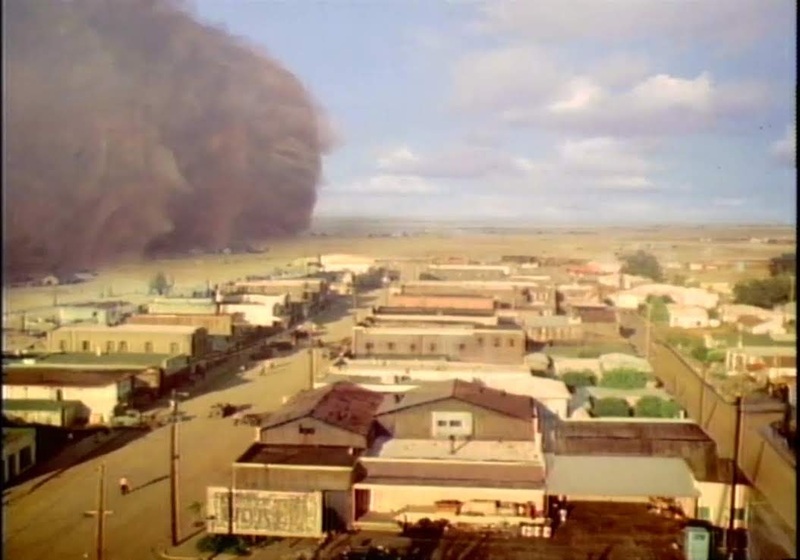 Al demonstrates the effects gag he employed for the massive dust storm in BOUND FOR GLORY where mere cotton discs were stop motion animated (with a lot of optical manipulation) into a matte painted composite of the small Kansas town. 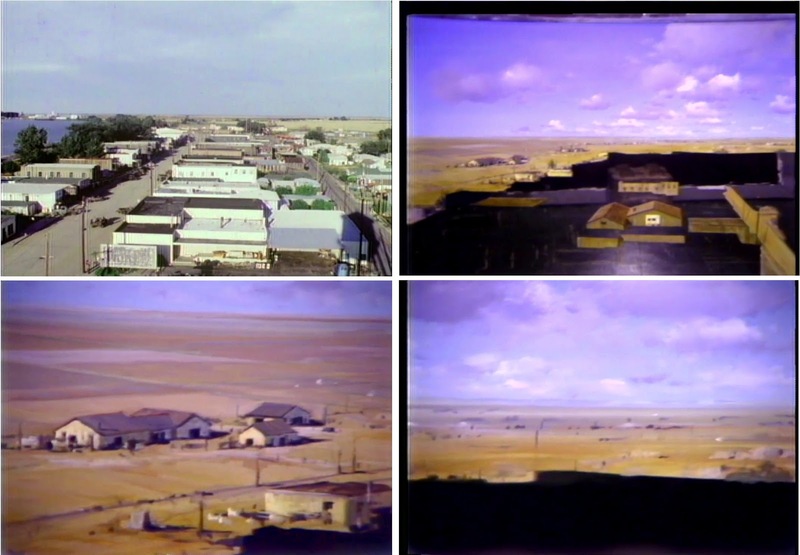 The final effect as seen in Al's sample reel where an actual town has been significantly augmented and extended via matte art, and the vast animated dust storm rolls on in to outstanding effect I must say. I've been aware of this shot for a while but had absolutely no idea that it was the work of Albert. The film is the British comedy YOU KNOW WHAT SAILOR'S ARE (1954) and was a lush, Technicolor affair, though I've not been able to track down the actual movie. This would have been one of the last films Al worked on at Pinewood before moving his family across the ditch to America and to eventually work at Disney. 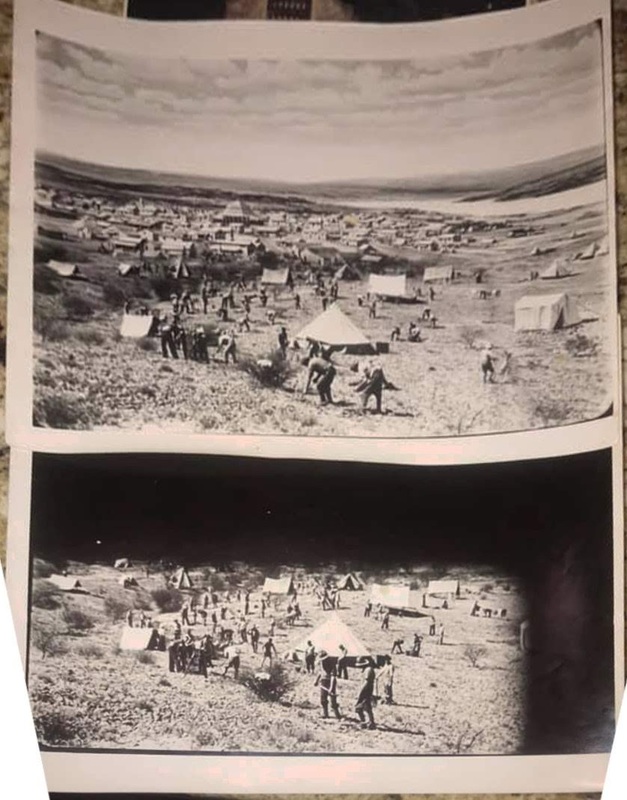 Some unidentified before and after snapshots that were in the care of Al's Grandson. The film is most probably YOU KNOW WHAT SAILOR'S ARE (1954) judging by the architecture and general design. A largely forgotten British comedy, though this Whitlock matte looks sensational! Universal-International's LOVER COME BACK (1961) is another of those 'possible' Whitlock shows, though once again, it comes at the tail end of Russ Lawson's era so could in fact be his work? It's quite a nice shot though. 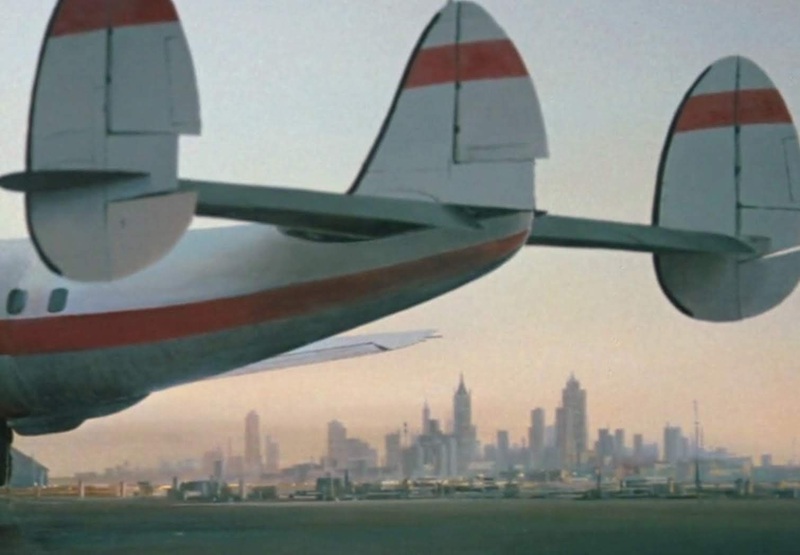 Two more mattes from LOVER COME BACK (1961) with a skyscraper and a ceiling being the order of the day respectively. Whitlock or Lawson? Maybe the former I suspect. The Rock Hudson military drama A GATHERING OF EAGLES (1963) had a few matte shots that would have been by Albert. 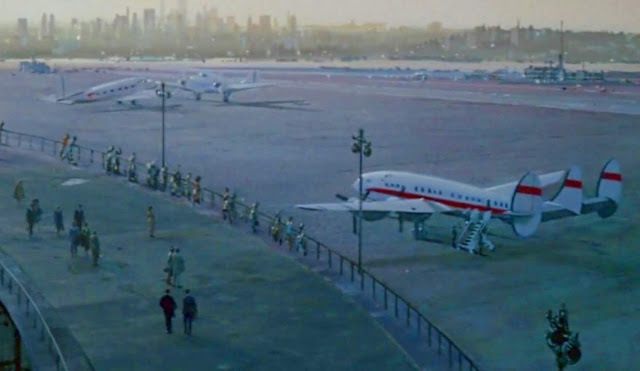 This shot where the lights come on at the air force base appears to be a full painting with animation artwork overlay. No effects credit on the film. 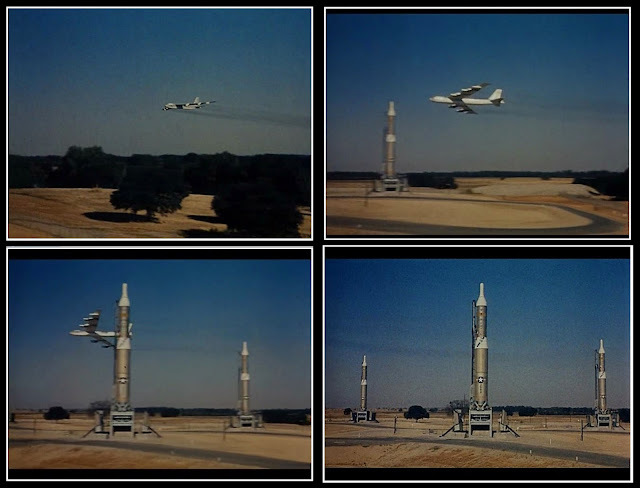 Also from that same film is this sequence where a bomber flies past an ICBM installation, which would have been impossible to film for real, so effects work was called upon. My FX pal sent me these among others, and feels it's Whitlock, though I tend to see it more likely as a foreground miniature set up. It does look good though. 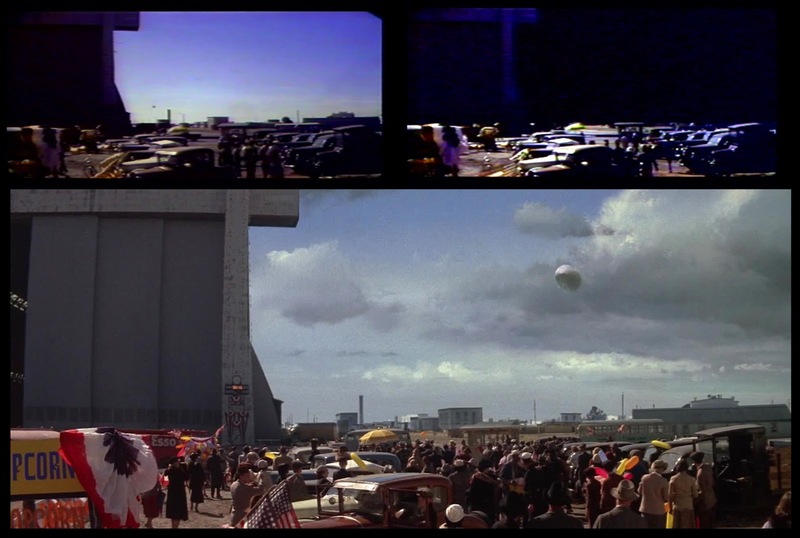 A rare before and after of Rio from the excellent though sadly unreleased in any format, Universal 3 hour drama VANISHED (1971) which would see Al receive an Emmy nomination for his matte effects. Whitlock - the master of atmosphere and light. THE PRISONER OF ZENDA - painted detail. 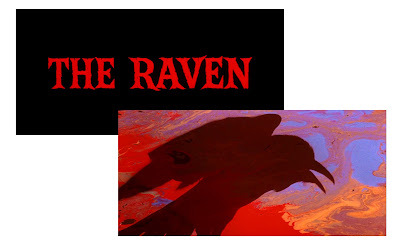 Roger Corman made a ton of Edgar Allen Poe inspired costume pictures, and by and large they were pretty good. 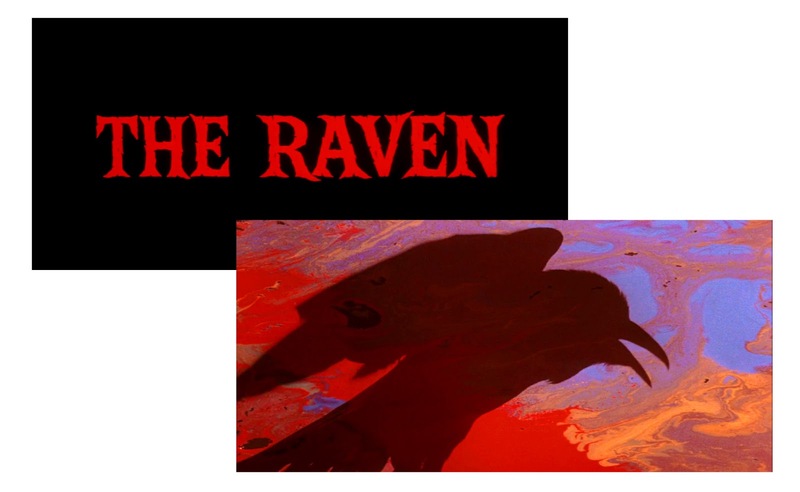 THE RAVEN (1963) was another of the Laurence Butler/Donald Glouner VFX contracts where matte work was farmed out. Butler often turned such assignments over to Whitlock, who was happy to freelance on a variety of projects. Al never got any credit for these but apparently had a good working relationship with Larry Butler, who according to Al 'treating me well'. I can't be 100% sure that Al worked on THE RAVEN but I tend to think he did, as the majority of the shots look like his work. 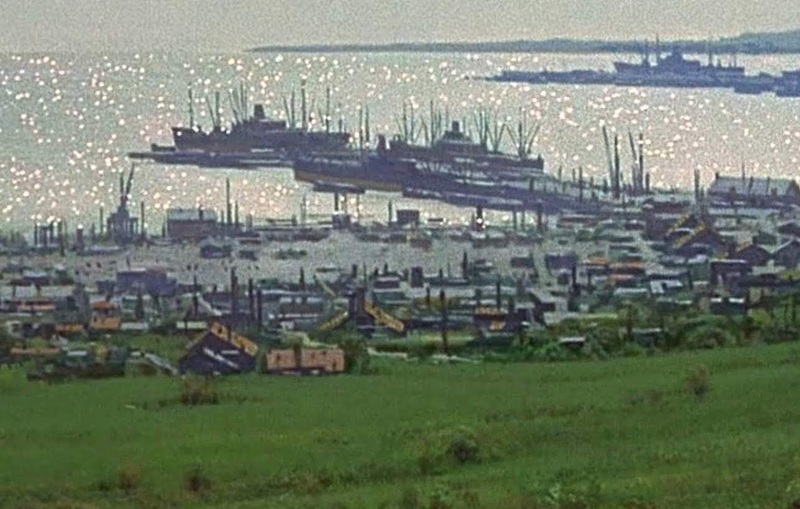 This shot was often used by Corman in other films such as THE TERROR and became a familiar 'stock' shot over the years in films and, horribly cropped on tv. 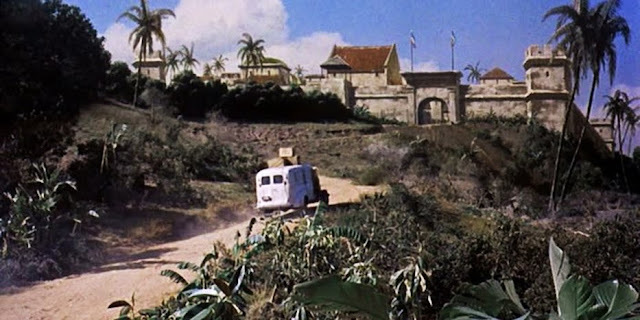 Also from Roger Corman's THE RAVEN (1963) was this perilous clifftop carriage ride. The spindly branches of the dead trees are classic Whitlock and would be a frequent artifact in many of his matte shots over the years. 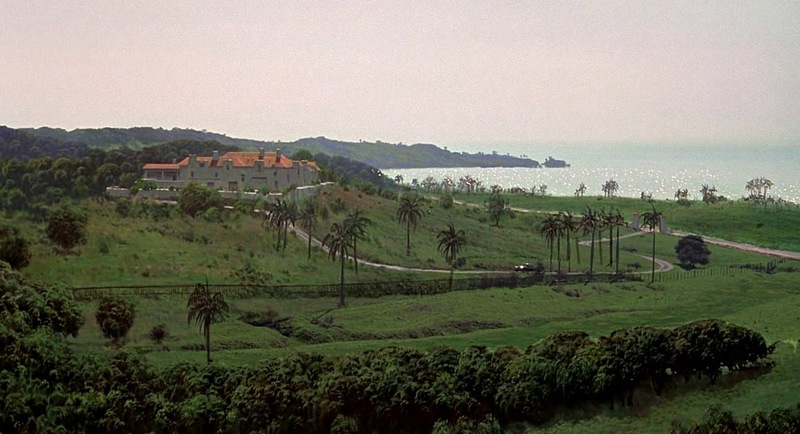 From the same film is this very poor quality shot. Nothing here suggests Whitlock to me so I wonder if it was rendered by another artist for hire? 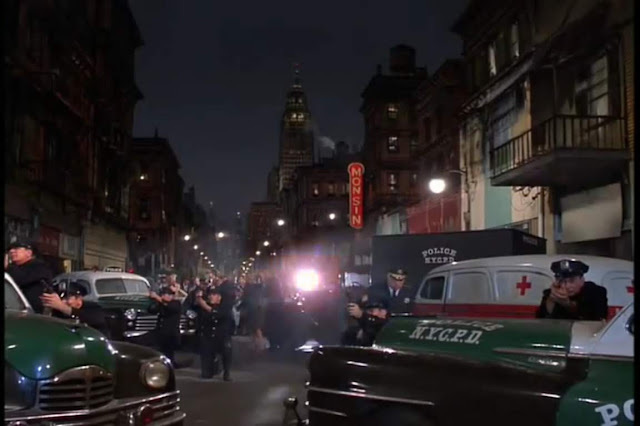 The glaring matte line is a shocker, and looks even worse in CinemaScope. I'm aware that the actual photography and compositing for Al's freelance assignments was often beyond his control and handled by the individual optical house. 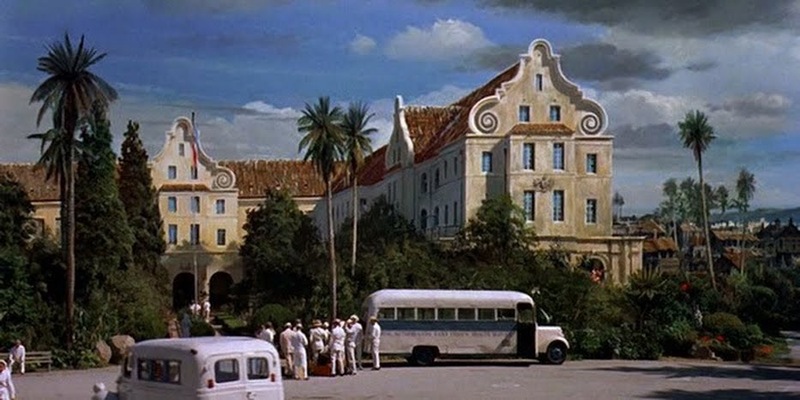 Some revealing before and after frames from one of Whitlock's showreels from the Hitchcock film TOPAZ (1969) where the Port of Havana, Cuba has been rendered by Al. Many thanks to Walton Dornisch for putting all of those shots together. Another fabulous shot from TOPAZ was the completely convincing Hacienda scene where Whitlock painted in practically the entire view, which Jim Danforth once remarked to me he especially admired among Al's shots. 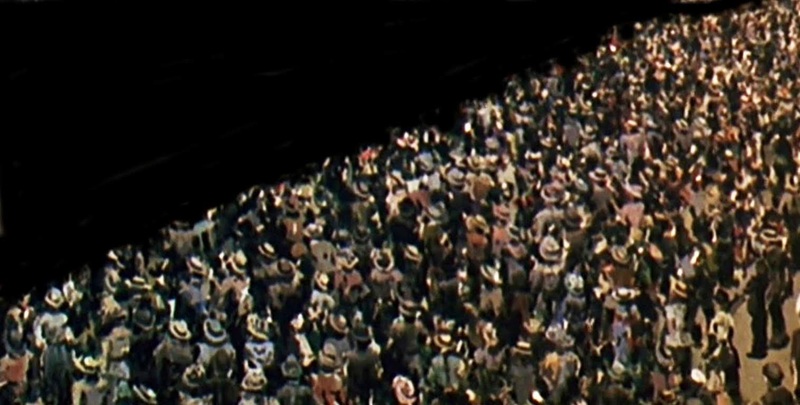 I had poor quality frames of this seemingly invisible sequence from SHOWDOWN (1971) in the previous blog, so I figured I'd include BluRay shots here to appreciate the subtlety of Al's work. 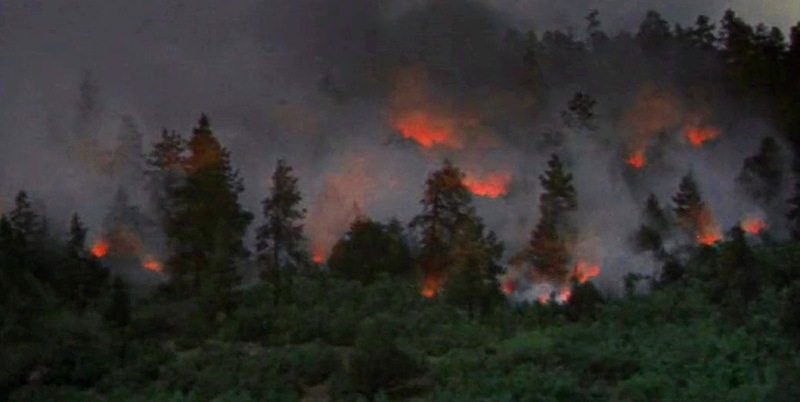 A seemingly straight forward sequence with a forest fire was actually quite clever. 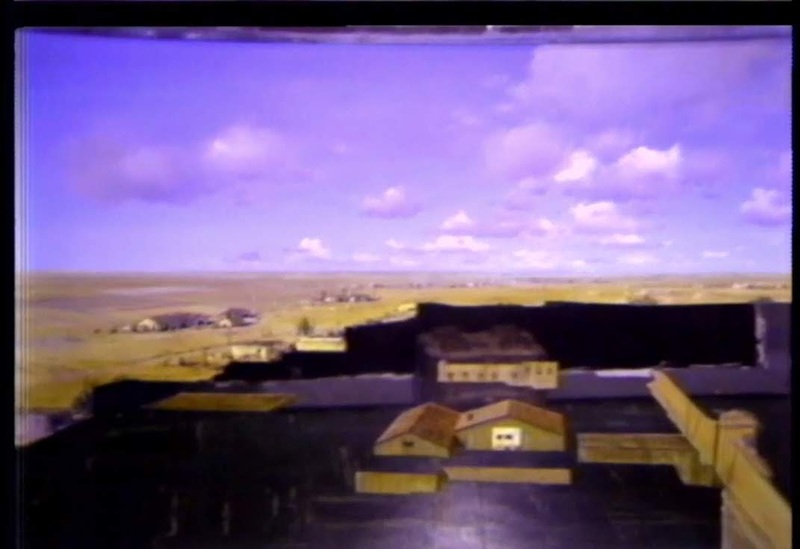 An actual hillside with painted in storm clouds and what I assume to be an array of smoke pots controlled by the physical effects crew. Albert carefully matted in simulated flames, presumably manufactured as painted elements on the matte stand, carefully rotoscoped behind trees and in underbrush. It's quite brief but impressive. The inferno spreads across the mountainside, leading to a dramatic climax. All of the 'fire' elements were rendered by Whitlock and matted in very convincingly by cameraman Ross Hoffman. It looks like additional smoke elements have also been added over the individual fire gags to prevent a false looking 'cutout' look to the composites. I made a frame blow up from the above BluRay frame so as to appreciate the trick in effect. 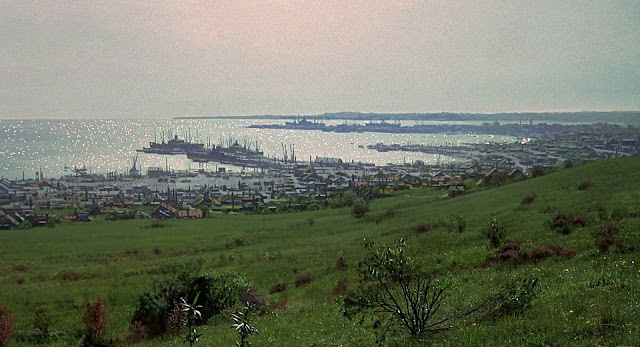 As I mentioned, some of these shots appeared in the previous blog but in cases such as with MAME (1974), I have since obtained high resolution frames directly from BluRay which are remarkably crisp compared with the earlier DVD grabs. I've included all of those mattes as well as several blow ups for detail and mock ups to deliniate just how much was painted. Close up of some of the painted portion from the matte shown above. Top frame from MAME (1974); lower frame from CHAPLIN (1990). 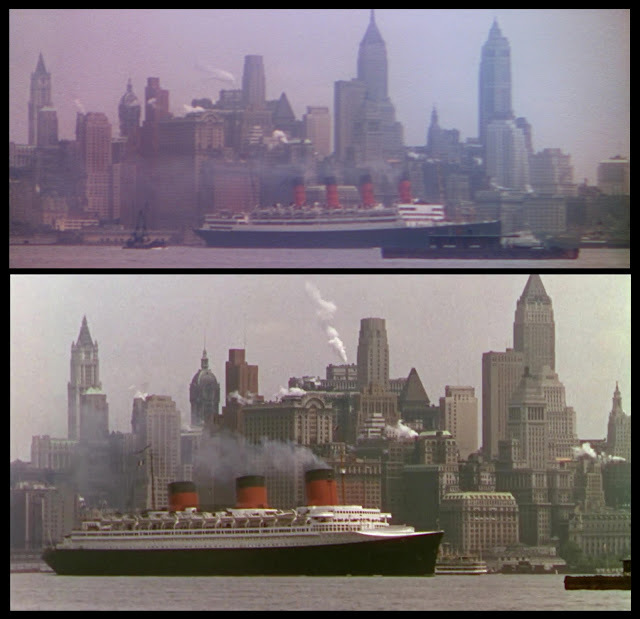 The exact same matte painted New York city has been used for both films, several years apart, with a different ship (also on glass as an additional foreground element) rendered for each film. The curious thing that I can't get my head around is this, why is the 'original' matte footage, as used in MAME of such seemingly 2nd generation or dupe quality, while the later re-use of the matte art and new ship for CHAPLIN looks a million dollars and appears to be first generation, original negative?? 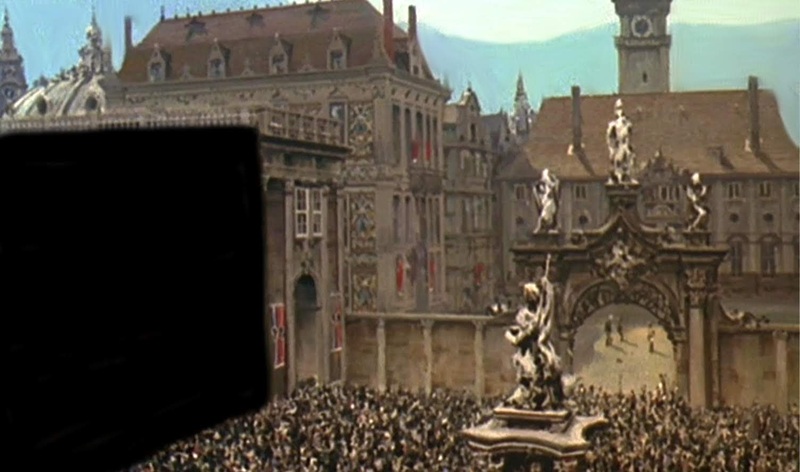 MAME was a Scope film whereas CHAPLIN was not, thereby explaining the cropping of the lower frame, but why oh why is the 'original' MAME shot of such poor resolution (and this is from the BluRay where all the other footage looks sensational!). 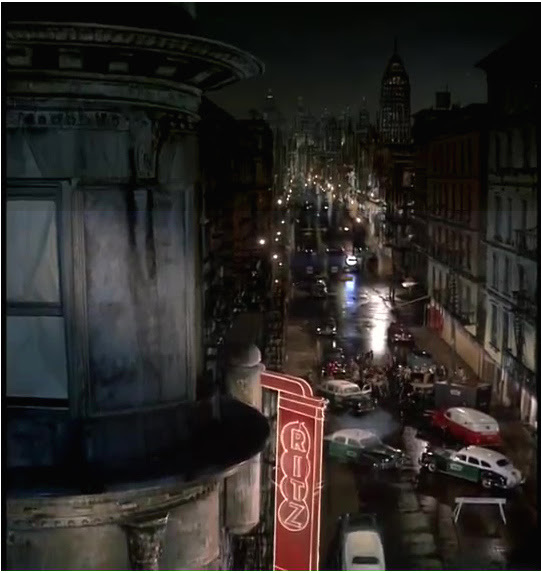 It almost looks as though the 'original' MAME shot was possibly lifted from an entirely different film made earlier?? I'd understand it to some extent if the shot had been a part of an optical dissolve but the MAME shot was a straight 'cut'. The later CHAPLIN shot however had a title superimposed over it as an optical but never suffered. Any experts care to explain this anomaly? 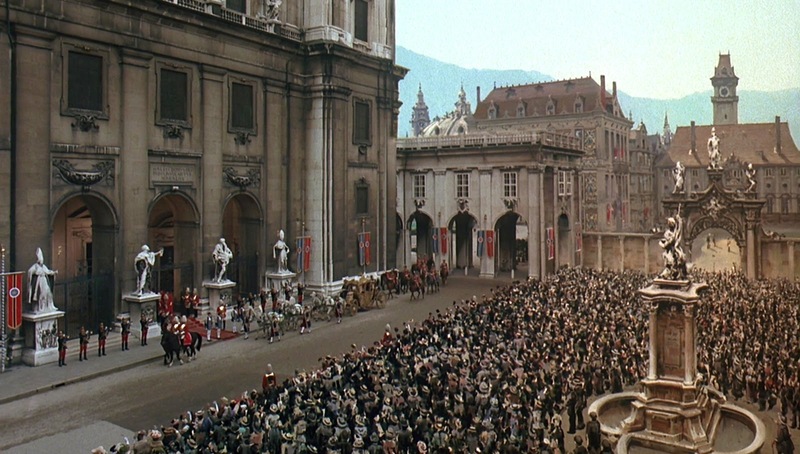 The majestic Lady Liberty scene from MAME as better seen now on BluRay. One of Al's best shots. Oh boy, what a magnificent shot. 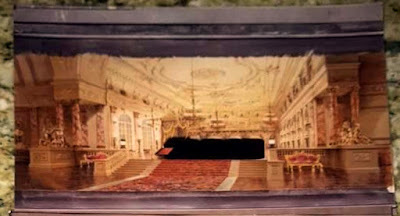 The ballroom musical number from MAME where all is painted except the tiny slot in the middle with the people. See below for closer detail. Some beautiful detail from the ballroom sequence. Note Al's pencilled in perspective lines still clearly evident. More detail, again with Al's perspective lines clearly visible. Other Whitlock shows such as DAY OF THE LOCUST and EARTHQUAKE also have these pencil lines visible in some shots, though it's really only noticeable on HD formats. 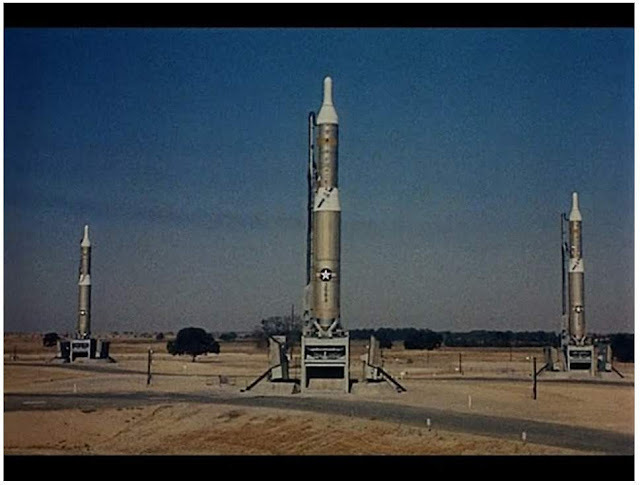 Practically all matte painted, with just two areas of live action - the controllers in the (painted) tower and the foreground group of extras. Looking closer at the matte shot we can see the mass of painted people just beyond the matte line with the two 'real' people. I just love Albert's loose, impressionistic brushwork. 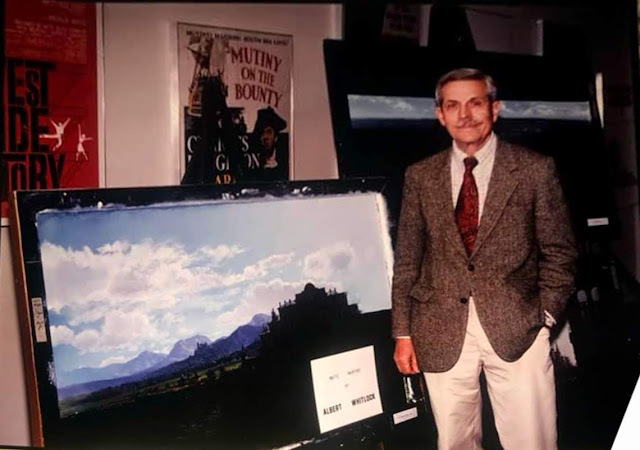 Al always instinctively knew just how much to paint and where to put the detail, with just enough to sell the fictitious view as believable. Very little actual set required as Albert painted in everything; the plane, airport, cityscape and magic hour sky. 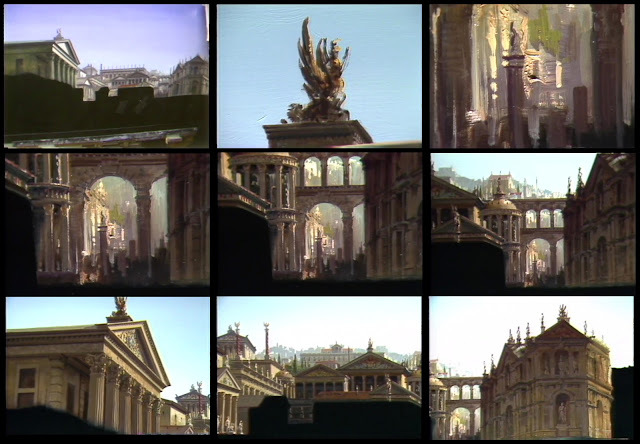 A closer view from the BluRay frame. Another film that I in no way can confirm whether or not Albert had any involvement was Stanley Kramer's brilliant JUDGEMENT AT NUREMBERG (1961). I include it here as pure speculation as the work looks like the style Al employed, especially the sky. The matte is invisible and blends in perfectly with the live action. Al would later work with the same director on SHIP OF FOOLS. The Brooke Shields comedy BRENDA STARR (1989) utilised the services of Illusion Arts, with input by Albert, though to what extent I don't know. Another uncertain entry in the Whitlock speculation stakes was TWICE TOLD TALES (1963) which had this nice painted view of Tuscany. No effects credit but possibly a Butler/Glouner show. No real evidence that Whitlock did the work but I felt it's worthwhile including here all the same. A rare document which served as the official submission to the Academy for Visual Effects consideration for the film EARTHQUAKE (1974). This details the various matte shots. 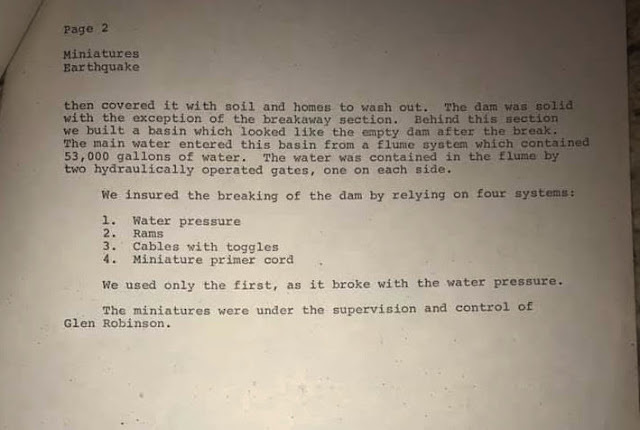 More from the same official submission, though in this case pertaining to Glen Robinson's miniatures. I include it out of interest as many readers are like me and 'dig' model shots. Some great info here as to the rigging of the collapsing model buildings and freeway is really informative. 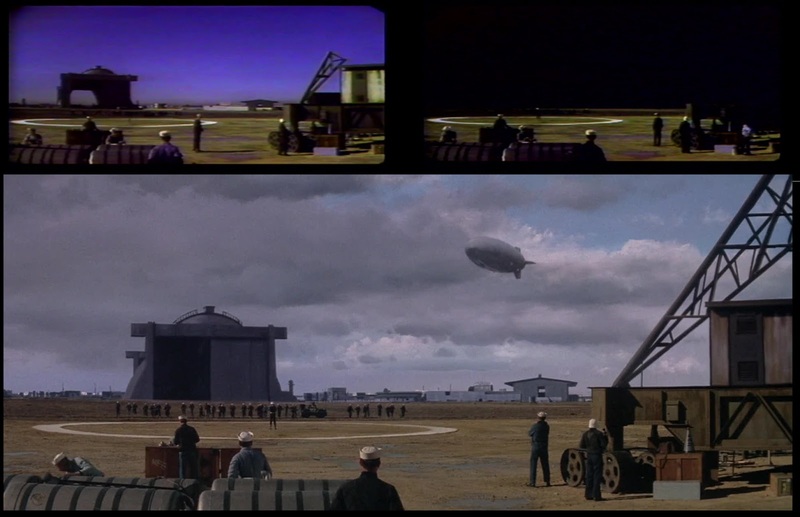 Oscar winning matte effects from THE HINDENBURG. Love Al's clouds. 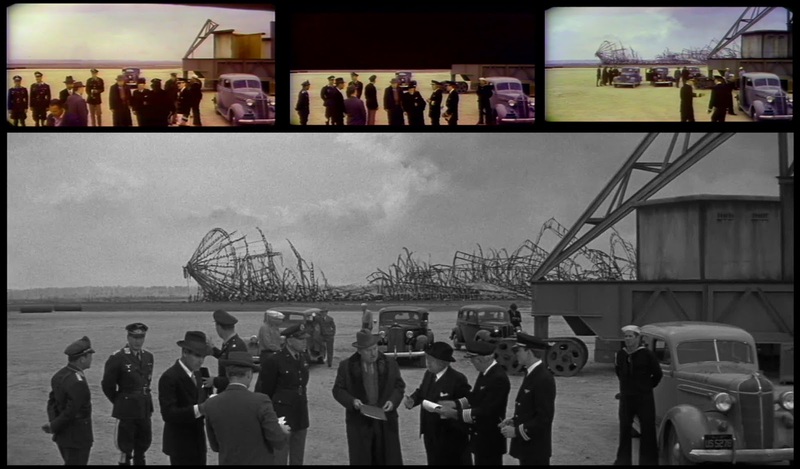 It's fascinating to actually view the matte in colour before the b&w release prints were made. 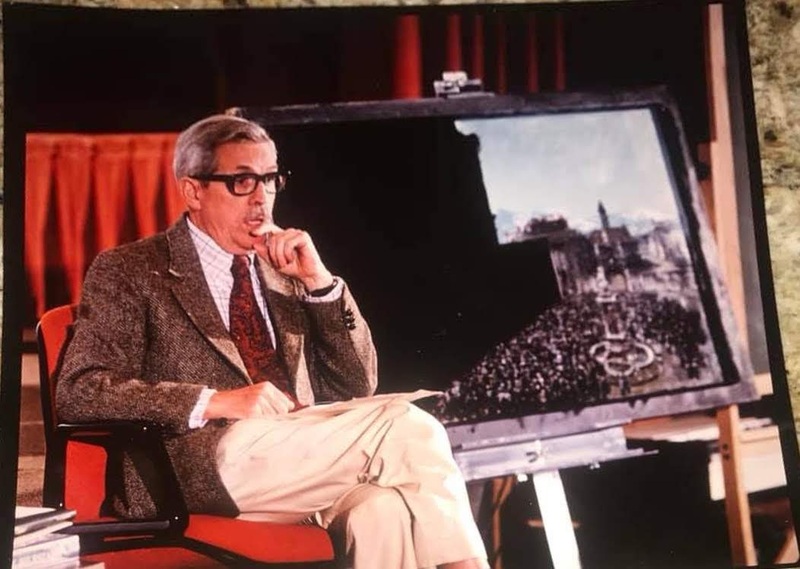 Frames from the newly upgraded Albert Whitlock-Master of Illusion, where the maestro is busy at work on Mel Brooks' HISTORY OF THE WORLD-PART ONE (1981). Note the free application of the brush for what will by all accounts appear as fine detail when viewed on the screen. Interestingly, Al would use devices such as a piece of cloth and his finger to create highlights on the fluted Roman columns. Such simplicity that might be otherwise cumbersome using the brush. The artist in his natural habitat. Detail from Al's major HISTORY OF THE WORLD matte shot. 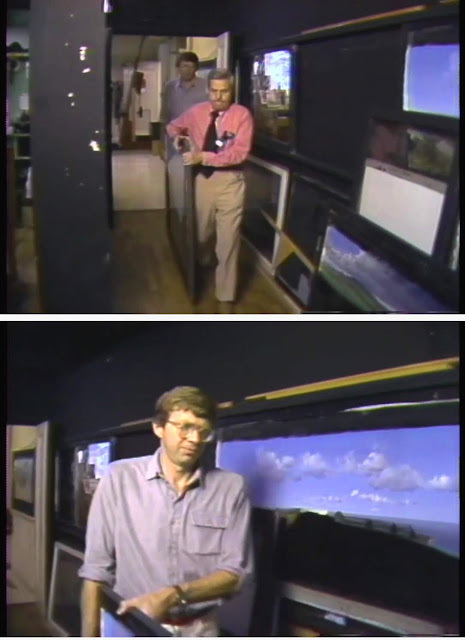 Syd Dutton and Albert haul a recently completed matte from the painting studio across to Bill Taylor's camera room. 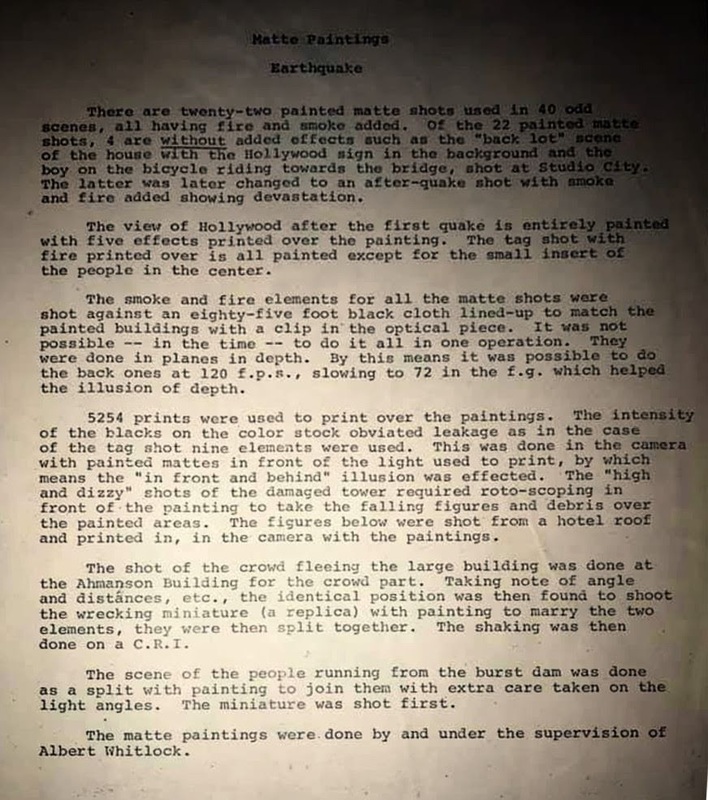 The paintings were generally stored overnight in a low heat cabinet to cure the oil based pigment and varnish to allow for safer handling the following day. 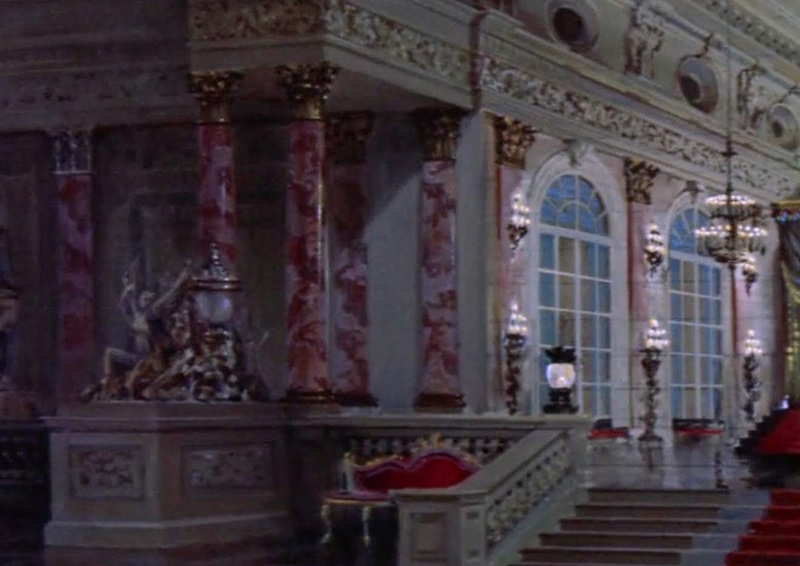 Note the assorted mattes lining the walls from DRACULA (uper image) and other unidentified productions. If anyone can i.d the large painting at the right in the lower picture, please let NZPete know. 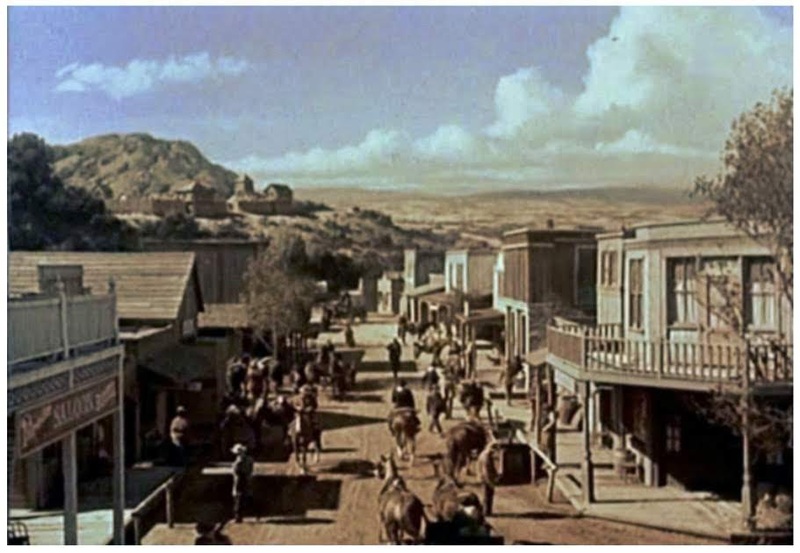 Before and afters from an unidentified Universal production, evidently a western, probably for television. The quality here is poor but the shot involves a guy hanging by his fingertips from a clifftop. Original matte paintings rendered for the same unknown production. These were auctioned off a decade or so back along with a number of other, mostly Whitlock mattes. I especially fond of this non film related oil painting of Albert's. Magnificent light and ambience. I believe this is one of several in the collection of Bill Taylor.